About 300 journalists from around the world are covering the pope’s visit to the region. By way of comparison, when U.S. president George W. Bush came to Israel, only 100 reporters were with him. The Jerusalem municipality, the Foreign Ministry and the Tourism Ministry will have a press center at city hall to assist foreign and local journalists during the four-day visit. It will be Israel’s largest and best-appointed such center. In addition, the balcony of the municipality building will be converted for use as a live broadcast site, overlooking the Jerusalem skyline. The building will also serve as the departure point for journalists and camera crews. The press center will offer hundreds of Internet access stations, a few quiet areas for face-to-face interviews, and live TV signals and radio feed of press pool coverage. There will be a second, smaller press center at Nazareth’s Golden Crown Hotel, near the Mount of the Precipice. The Tourism Ministry will distribute information to journalists aimed at boosting Israel’s image as well as incoming tourism. Among other things, it will stress that Israel provides full freedom of worship and full access to holy sites, develops and maintains these sites, and supports mutual understanding, and that Jerusalem offers a combination of ancient holy sites with a modern urban infrastructure. It will also emphasize the increasingly close relationship between Israel and the Vatican. The ministry will also explain that pilgrims can take advantage of other attractions in Israel, such as spa treatments at the Dead Sea and nature walking trails. The ministry intends to use documentary material from the pope’s visit in future tourism campaigns targeting countries with large Catholic populations. So many wonderful photo opportunities that will help drive “pilgrim tourism” — a source of revenue that will have pumped $22.5 million into the Israeli economy this week alone. But then comes the image that will* should overshadow all others: the Pope in a fully operational open-air prison camp. No need to get lost in a debate about whose memories he is giving sufficient attention to — the visible reality of incarceration is inescapable. The Pope’s vaguely Reaganesque moment when he said that walls “can be taken down” not only evoked the fall of the Berlin Wall, but intentionally or not, called attention to the differences between the two barriers. East Berliners were deprived of all sorts of liberties, yet even they enjoyed far greater freedom than Palestinians. The emancipation of those oppressed by authoritarian communist rule was a popular cause among freedom-loving Americans. The emancipation of Palestinians from Israeli oppression… oh, that’s something we’re not even interested in thinking about. *Having scoured the web in search of decent images of the Pope with the Wall behind him, I have to conclude that either press photographers were prevented from getting good shots or they colluded in self-censorship. 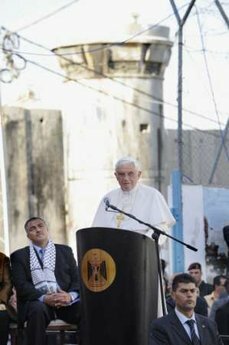 Pope Benedict XVI criticized Israel’s construction of a security barrier through the West Bank and urged a loosening of restrictions on the Gaza Strip on Wednesday, a day of speeches and symbolic appearances that amounted to a running critique of Israeli policies toward the Palestinians. From a morning address alongside Palestinian Authority President Mahmoud Abbas to a late-afternoon visit to a refugee camp, the pontiff used a full day in the occupied West Bank to highlight some of the main issues on the Palestinian agenda. President Barack Obama has sent a message to Prime Minister Benjamin Netanyahu demanding that Israel not surprise the U.S. with an Israeli military operation against Iran. The message was conveyed by a senior American official who met in Israel with Netanyahu, ministers and other senior officials. Earlier, Netanyahu’s envoy visited Washington and met with National Security Adviser James Jones and with Secretary of State Hillary Clinton, and discussed the dialogue Obama has initiated with Tehran. When Philip Zelikow, the former counselor to Secretary of State Condoleezza Rice, testifies before a Senate Judiciary subcommittee Wednesday about controversial legal opinions issued by the Bush-era Justice Department, he’ll be wading into a political maelstrom. Former Bush administration and CIA officials have accused Congressional Democrats of hypocrisy for calling for investigations of the interrogations policies, saying that some, including now House Speaker Nancy Pelosi, were briefed on the techniques employed and approved them. Zelikow, who revealed last month on ForeignPolicy.com that the Bush White House tried to destroy all copies of a 2006 memo he wrote opposing the policies, has generally sought to avoid the political spectacle, but describes the program as a collective failure. He is calling for an independent commission to investigate what happened. The Obama administration is weighing plans to detain some terror suspects on U.S. soil — indefinitely and without trial — as part of a plan to retool military commission trials that were conducted for prisoners held in Guantanamo Bay, Cuba. Editor’s Comment — Indefinite detention is unconstitutional. Obama took an oath to uphold — not tinker with — the US Constitution. If there isn’t sufficient evidence to prosecute detainees, they should be released. In a free society, people cannot be confined indefinitely purely on the basis that they are deemed to pose a risk. Congressional Democrats are voicing growing unease over the Obama administration’s national security policies, including the seemingly open-ended commitment in Afghanistan and the nettlesome question of what to do with prisoners held at Guantánamo Bay, Cuba. House leaders have yanked from an emergency military spending bill the $80 million that President Obama requested to close the detention center, saying he had not provided a plan for the more than 200 detainees there. The White House has said the center will close by Jan. 22, 2010. It is virtually certain that the Democratic majorities, with solid Republican support, will approve $96.7 billion in spending for the wars in Iraq and Afghanistan and for other military operations. As vice president, Richard B. Cheney famously spent much of the past eight years in undisclosed locations and offering private advice to President George W. Bush. But past was not prologue. Today Cheney is the most visible — and controversial — critic of President Obama’s national security policies and, to the alarm of many people in the Republican Party, the most forceful and uncompromising defender of the Bush administration’s record. His running argument with the new administration has spawned a noisy side debate all its own: By leading the criticism, is Cheney doing more harm than good to the causes he has taken up and to the political well-being of his party? As classes begin at the Jamia Naeemia madrassa, an Islamic college in Lahore, the courtyard echoes to the sound of 125 students reciting the Koran. Mostly from poor families in Punjab and North West Frontier Province, the youngsters are prime targets for the Taleban and other militant groups preaching the fundamentalist forms of Islam in Pakistan. Here, however, they are learning a different doctrine that is music to the ears of Pakistani, US and British officials. “The Taleban is a stigma on Islam,” says Sarfraz Ahmed Naeemi, a Sunni cleric who heads the madrassa. “That is why we will support our Government and our army and their right to destroy the Taleban. We will save Pakistan,” he told The Times. At the entrance to the Hazrat Usman camp just south of the Swat Valley, a welcoming committee greets those fleeing violence between the government and militants with a cool glass of water, a meal and a place to sleep with fans and a pharmacy. Though camp organizers don’t voice any overt sympathy for the Taliban, their view is clear: The entire crisis is a creation of the government and the army. Two miles up the road sits the much larger government-run Jalala camp. It is hot, mosquito-ridden and busy turning newcomers away. Water, food and medicine are in short supply, tempers flare and many people are forced to sleep in the open — a particular indignity for women in this Islamic society. Research by the BBC Urdu’s service into the growing strength of Taleban militants in north western Pakistan shows that only 38% of the area remains under full government control. Russia raised the prospect of war in the Arctic yesterday as nations struggle for control of the world’s dwindling energy reserves. The country’s new national security strategy identified the intensifying battle for ownership of vast untapped oil and gas fields around its borders as a source of potential military conflict within a decade. Is this what America has come to? That it is more important to you that Cheney might be damaging the Republican Party by his comments about torture than that your country had a policy of deliberately torturing people? Or that your country has scapegoated low level soldiers while rewarding those who ordered the torture? Or that no American, so far as I know, has even thought of recompensing the victims for what was done to them? Bravo Alex! We are using law as cover-up, hitting at little guy “just taking orders” in War on Terror. When a nation of laws, no one is above them and, more importantly, the little guy following orders is not the scapegoat. “Republican” used to be the party of individual responsibility….but perhaps then I was smoking very strong hallucinogen…Now I’m recovered and despaired.